On Holy Thursday Father Z wrote an excellent post on the controversy concerning the Holy Father’s comments on the existence of hell. I would say that if there is no hell, we should probably stay home today or tomorrow. There is a hell. Jesus said so. And Jesus can’t lie. It’s as simple as that. What’s the point of all this Easter “stuff” if there’s no hell. Because, since Jesus told us about heaven and hell, then they both must exist. If not, then Jesus is a liar and all the Catholics who only come to church on Easter and Christmas might as well just go straight to the buffet. Us, too. No, there is a hell and I, for one, don’t want to go there. 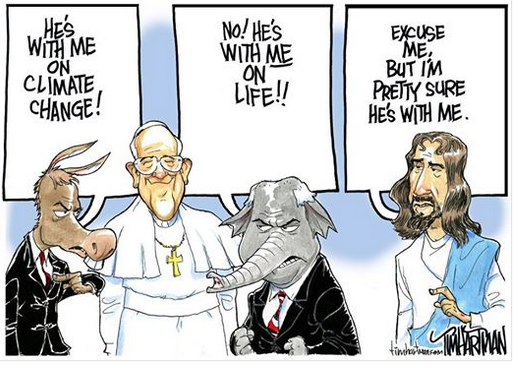 If an atheist, communist, newspaper reporter wants to twist the Pope’s words, then you and I must be smart enough to dig deeper and find out for ourselves what the Holy Father really said. Father Z’s post is a good place to start. I hope you and yours have the happiest and holiest Easter ever. Recently our Holy Father, Pope Francis, issued a document called Evangelii Gaudium, or the Joy of the Gospel. It’s fairly long, almost 70 pages, and frankly, I’ve only read about 2/3 of it, but I’m getting there. As usual, the media is trying to spin it as something that it isn’t. In the past week our president has quoted from it and several conservative commentators, including Rush Limbaugh and Bill O’Reilly have attacked it; an interesting turn of events to be sure. Our local paper, the Saint Louis Post Dispatch even joined in the fun. But, of the 70 pages the Pope has written, the critics have focused on just a few paragraphs on the subject of economics. As Catholics, you and I are called to follow the Pope’s guidance in matters of faith and morals. Francis is a brilliant theologian, but he’s not an economist and I don’t think he’s trying to be one. I don’t believe, as some would suggest, that he’s condemning capitalism in favor or socialism. What he’s written reflects the current problems of the poor. The idea that we should help the poor, to share what we’ve been given with those in need, isn’t a new idea. It’s what Jesus told us 2,000 years ago. I think most business leaders are basically good people. Sadly, there are some who aren’t. The real issue isn’t that making a profit is bad. The issue is what do we do with that profit? Do we buy bigger houses and better cars, or do we share it with those in need? Is it really a problem with our capitalist system, or is it a problem of minds and hearts? What I believe the Holy Father is saying in this lengthy document is that we must help the poor. Other than a few paragraphs, his focus is on the Gospel, not on politics or economics. In the second reading today, Paul writes to the Romans, “May the God of endurance and encouragement grant you to think in harmony with one another, in keeping with Christ Jesus, that with one accord you may with one voice glorify the God and Father of our Lord Jesus Christ. Welcome one another, then, as Christ welcomed you for the glory of God” Our call is to work together for the Glory of God. So, what does all this mean for you and me. We’re not business tycoons. We’re not politicians. We’re just average people doing our best to get through this life and to make our ways to heaven. But are we really just average? John says that Jesus will baptize “with the Holy Spirit and fire.” That’s pretty strong. For most of us it’s been a long time since our baptism. But the great thing about baptism is that it’s forever. We have just as much Holy Spirit and fire in us today as we did on our baptism day. It never leave us, but maybe our fire isn’t burning as brightly as it once was. It may just be embers but it’s still there, waiting for us to fan the flames. The title of Francis’ document is “The Joy of the Gospel.” In the third paragraph he gives us a very profound prayer, “Lord, I have let myself be deceived; in a thousand ways I have shunned your love, yet here I am once more, to renew my covenant with you. I need you. Save me once again. Lord, take me once more into your redeeming embrace.” Think about that. Why are we here at mass. We’re here to renew our covenant with Him. We do need Him, much more than He need us. If the fire of our baptism needs to be rekindled, the mass is the place to find the fuel. Maybe we take the Eucharist for granted. Maybe it’s just something we do because we’ve always done it. Let’s make this season of Advent a time of renewal. In a few minutes we’ll receive Christ into our own bodies through the sacrament of the Eucharist. What a great gift! That’s what keeps our fire going. If it’s not burning as brightly as it once was, it’s not the Father’s fault. It’s not Jesus’ fault. It’s not the Holy Spirit’s fault. God gives us the fuel, it’s up to us to use it properly. The joy of the Gospel! There is no greater gift! Praise God!